Please read this complete ad listing before ordering it can save you 10%. Choose 25 Wooden Crosses from the 8 in the pictures, You can mix and match or choose all 25 the same. The crosses are 4" by 6" and 1/2" thick made from MDF. Anything under 1/2'' thick will not have a keyhole. This listing is for 25 unpainted 4" x 6" x 1/2" cross of your choice. All of our items are cut from Plum Creek MDF consisting of 80% recycled materials. 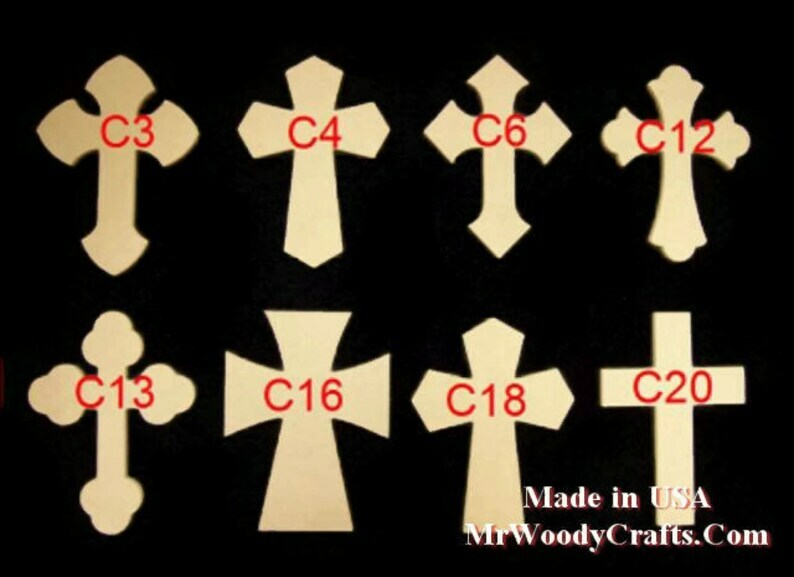 These crosses are great for church, home projects, home decor, gifts, etc. These crosses paint very well to suit your decorative ideas, but they do not stain well. May require light hand sanding. http://www.facebook.com/MrWoodyCrafts , Please Like Us ! DISCOUNT CODE, is posted on our wall around the first of each month, you will need to use it when checking out with Etsy, If you forget there is no way of going back to add it after you check out. NOTE ABOUT CURLZ LETTERS ! We can not cut lower case because we want to keep our fingers. 1/4", 1/2" 3/4" thick, see our other listings. This will speed up your delivery time. Have any questions? Contact the shop owner. Get 15% off your order when you buy 5 items at this shop. Discount shown at checkout. Special for next 30 days ( ends 5-22 ) buy 5 items and receive 15% off. Items must be paid for in order for us to start on your items. Easy online payments! We exchange anything that was broken in shipping or any items that were shipped incorrectly. We ship UPS ground and USPS. Depending on the weight of the order, most orders will ship USPS within 2-3 business days after payment is received and as long as we have all information completed from you. On most orders we will need to know what style of what you'd like; a specific size, certain letter(s), etc. Be sure to leave us a note with this information so we can get started on your order ASAP! Find us on Facebook at www.Facebook.com/MrWoodyCrafts. We post a new 10% off discount code the first of each month!